On February 14th and 15th 2009, 435 people attended the first ever Catholicism 201 conference in Trinidad organized by the catechetical office of the Archdiocese of Port of Spain. 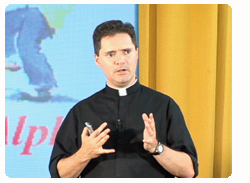 Catholicism 201 has been "an answer to a prayer" for Catholics all over the world. Read some testimonials on the success of the series. The Catholicism 201 series is widely regarded in Canada and Internationally. The series has been featured by both the Canadian Catholic News and by Alpha Canada.